Preheat oven to 350. Line or grease and flour 6 wells in a muffin tin. In a large bowl, mix all ingredients together until a relatively smooth batter forms. Fill each well 2/3 of the way full. Bake 12-15 minutes or until a toothpick inserted the center of a muffin comes out clean or with just one or two dry crumbs. Cool briefly in the pan, then remove to wire racks to cool completely. I got these super cute cupcake/muffin liners last year and didn't get a chance to use them. I couldn't let another Halloween pass me by! I made cupcakes earlier this month so I thought I'd make muffins instead. I had some shredded beets leftover from my faux Thanksgiving yesterday (when I create and test the recipes for my November Thanksgiving posts) and with Hurricane Sandy headed our way, I thought it would be a great way to use them up and have something tasty to snack on just in case. They ended up the most delightful shade of purplish red and almost perfectly matched the red "drips" on the liners. They are incredibly moist thanks to all of the beets but very light and fluffy as well. In a large pan, saute the ground beef and chorizo until fully cooked, breaking up any large chunks with the back of a spoon. Drain the fat off of the meat. Add the tomatoes and beans to the meat mixture. Simmer until the beans and tomatoes are heated through and most of the liquid has evaporated. In a second pan, saute the potatoes, peppers, onion and garlic until the potatoes are soft and the onions are caramelized. Arrange the potato mixture in the center of each tortilla. Top with meat mixture and desired toppings (I used just sour cream and avocado). 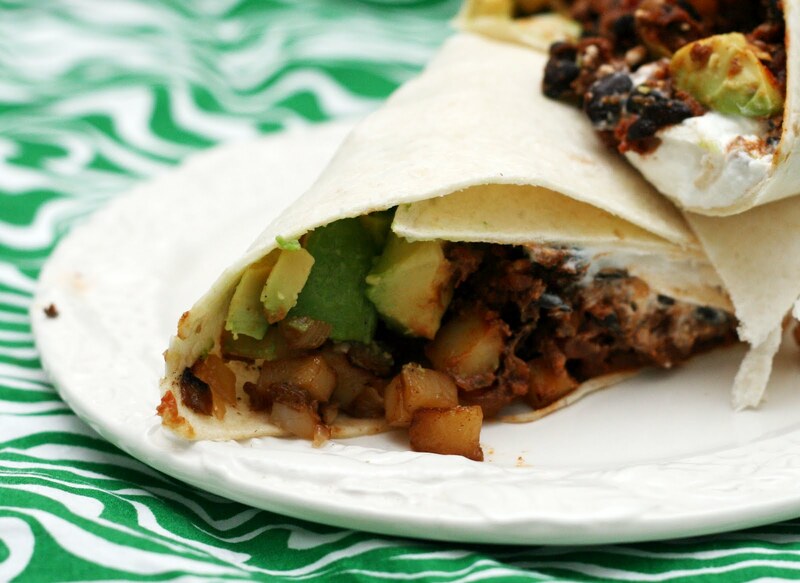 Fold all sides inwards to form burrito. We had some cayenne peppers from our garden and a tube of chorizo sitting in the fridge for what felt like forever and I wasn't sure what to do with either. I happened to have some jumbo burrito-sized tortillas on hand so why not make burritos? Why not indeed. My husband wanted rice in his but I opted for the potato filling I'm sharing here. It was like spicy home fries meets the most flavorful meat ever and formed the best burrito I've made at home ever. Yum. I love how the chorizo added a ton of flavor to the beef so I didn't have to season it too much, making it a great weeknight meal. In a large pot with a lid, soak the beans overnight. Drain the beans and return them to the pot. Fill with water and bring to a boil for 10 minutes*. Drain the beans and add them to a 4 quart slow cooker. Add the remaining ingredients from group #1. Stir. Cook on low 8-10 hours. About 30-45 minutes before you would like to eat, remove 1 1/2-2 cups of the beans from the slow cooker. Pour them into a bowl and mash them with a potato masher until they are creamier but little chunks remain. Pour them back into the slow cooker. Stir in the ingredients from group #2. Continue to cook the 30-45 minutes until you are ready to eat. 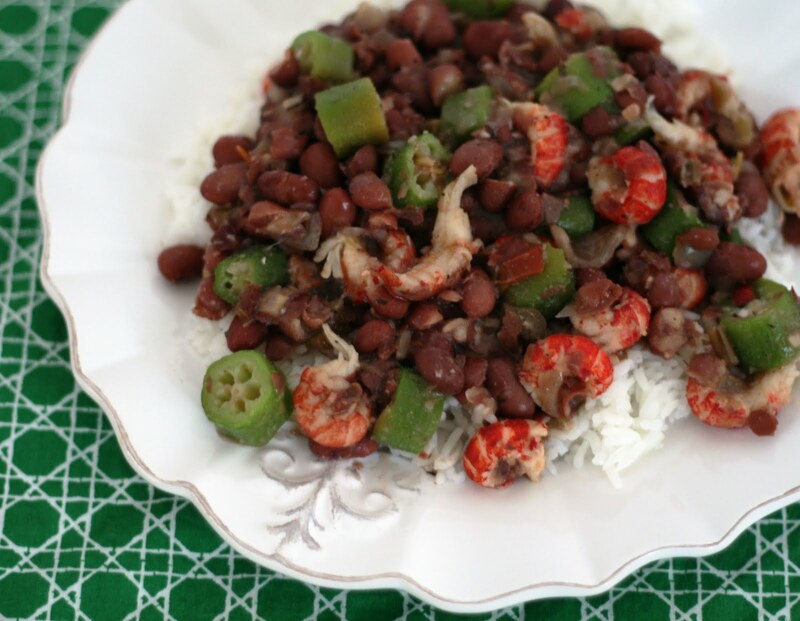 (If you don't want crawfish and okra in your red beans and rice, skip this step and just serve). Discard bay leaf and stir before serving over hot rice. *Red beans must be cooked before serving in order to avoid kidney bean poisoning. It is not safe to skip the boiling step. I get so many requests for "whole meal" slow cooker recipes this time of year and we are still getting peppers from our garden so I thought I'd come up at new recipe that would use up the peppers and use the slow cooker in a new way. As always, I prepped the vegetables, de-shelled the crawfish and fried the bacon the night before so the only thing I had to do in the morning was boil the beans and get the rice going in my rice cooker. If you don't have a fancy rice cooker with a "keep warm" setting, make your rice when you get home so it cooks while the crawfish and okra are cooking. I've seen recipes for red beans and rice that call for ham hocks and that's probably more traditional but I think bacon works well here and is a lot less work; no need to pick meat off the bones before serving. It is a little unconventional to stir in crawfish and okra but I saw crawfish at the store again (I bought all that was in the display case!) and thought it would be a good addition and alternative to heavier sausage. The okra was added to make it more of a complete meal.. I like to mash some of the beans and return them to the pot because it makes the final dish so much more creamy. The end result: a thick, creamy, comforting, filling dish of New Orleans that is ready when you are. Preheat the oven to 350. Grease and flour or line 12 wells in a cupcake pan. In a large bowl, cream together butter and sugar until light and fluffy. Add egg, vanilla, and milk. Beat well. Add the flour, baking powder and salt. Beat until the batter is light and fluffy. Fill each well 3/4 of the way. Sprinkle with chopped candy (I used one variety per cupcake but you could mix) and poke the candy into the cupcake with a chopstick. Smooth the batter on the top of the cupcake, covering the candy. 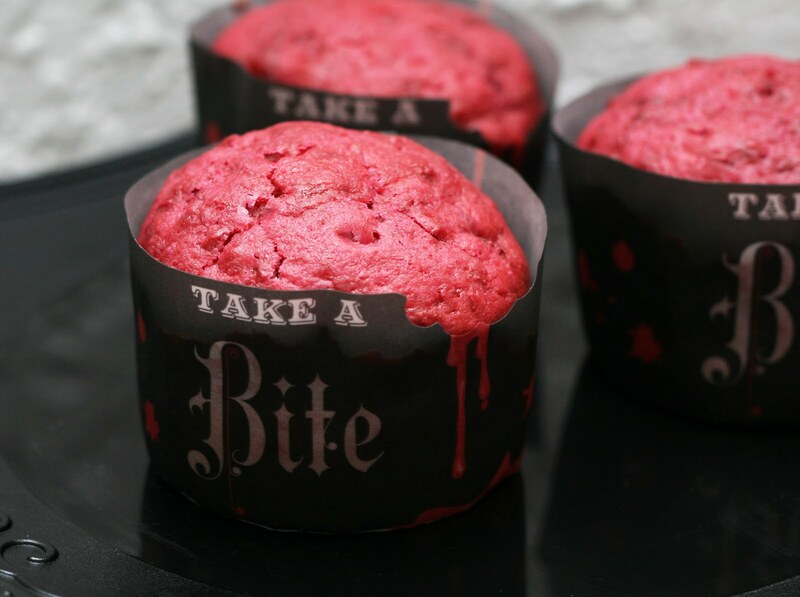 Bake 15-18 minutes or until a toothpick inserted in the middle of the middle cupcake comes out clean. 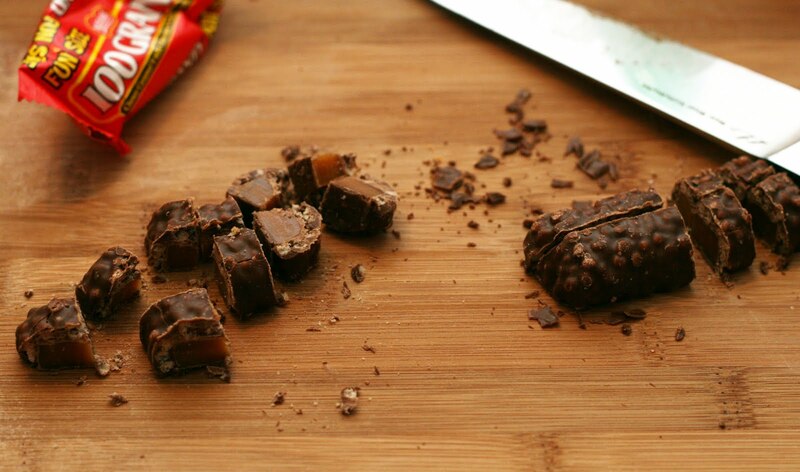 This is the perfect candy to use up Halloween candy before or after Halloween. The cake itself isn't too sweet so the addition of chopped candy doesn't push it to sickly sweet, treacle territory. 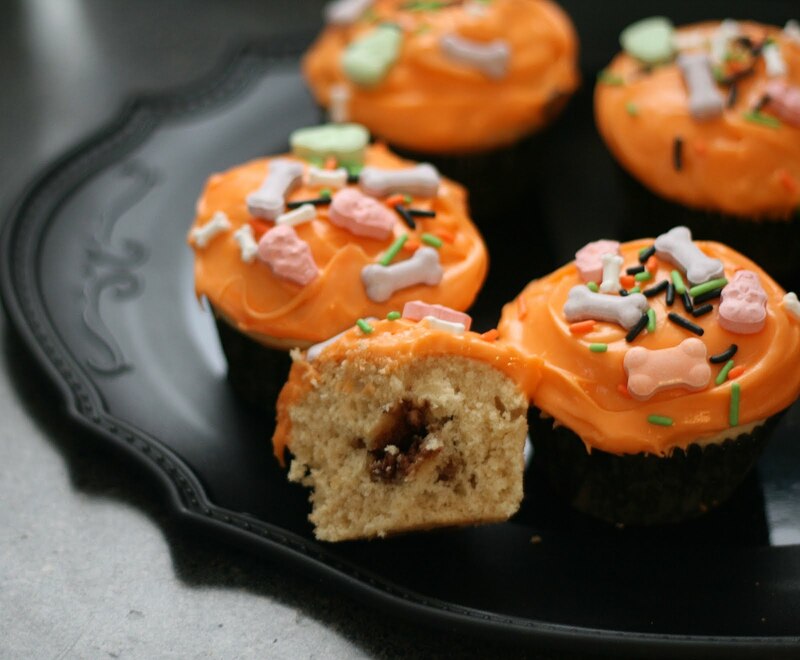 The candy adds a burst of chewy (or peanut-y) chocolate in the center that is a fun surprise. 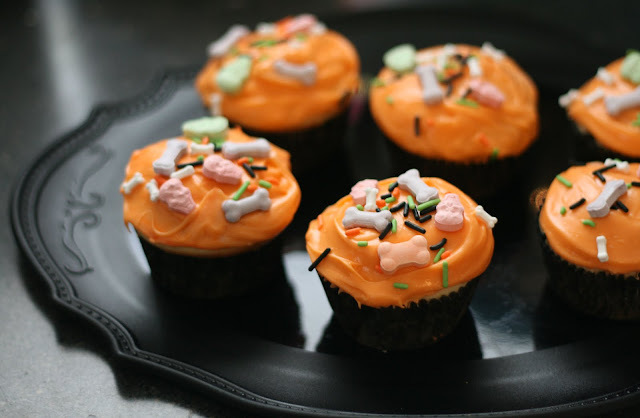 I was careful there is nothing visible from the outside of the cupcake to tip that there is a treat inside. I did a little experimenting and found that caramel based bars without nougat or simple candy like chocolate cover peanuts or fruit work the best. Nougat has a tendency to run, while the caramel melts but pretty much stays put (see above, that was a 100 Grand cupcake). You could skip the candy on the top but I loved how detailed the SweeTarts candy was this year. One note, the candy in the individual fun sized SweeTarts bags is smaller than the candy in the full sized bags, I used both but either would work. Just have fun with it. Place all ingredients (EXCEPT THE PORK!) into a blender and pulse until smooth. Pour over the pork in a marinating container or resealable bag. Refrigerate overnight. The next morning, pour everything into a four or two quart slow cooker. Cook on low 8-10 hours. Shred the pork with two forks in the slow cooker. Toss to evenly distribute the sauce. Serve on rolls. I had some pumpkin leftover from making cookies and I was worried it would go bad before I had a chance to use it but then I had the idea to add it to the pulled pork I planned on making. I wasn't sure how it would turn out, I've made a lot of pulled pork before but never with pumpkin. But it sounded tasty (and seasonal) so I thought it was worth the risk. I went sort of Jamaican inspired with the rest of the seasonings because I didn't want the pork to be sweet, which I think a lot of pumpkin recipes end up being. 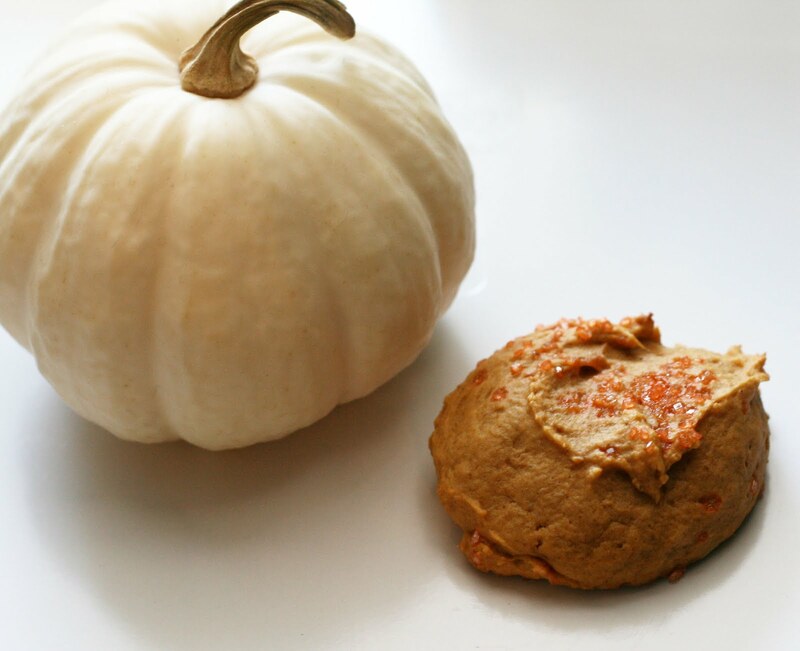 Which is a shame because pumpkin is wonderful when given the savory treatment. I ended up loving the combination. It had a small kick to it but mostly the seasonings brought out the earthiness of the pumpkin. I liked the technique I used for this recipe too, pureeing the sauce the night before means little to no chopping required, zero work in the morning and the flavor really penetrated the pork. Win-win. My husband not only ate seconds of the pork, he made immediate plans to bring leftovers to work with him today. If that isn't an endorsement I don't know what is! Preheat oven to 375. Line 3 cookie sheet with parchment paper. Cream together the sugar and butter until fluffy, the add the liquid turbinado sugar and egg. In a second bowl, whisk together all of the dry ingredients.. Add the dry mixture and pumpkin alternately to the sugar mixture. Mix until well combined. Drop tablespoons of dough onto the lined cookie sheet. Sprinkle with colored sugar if desired. Flatten the cookies slightly with the back of a spoon. Bake for 12 minutes. Slide the parchment paper (with the cookies still on top!) onto wire racks. Cool completely. Sprinkle with confectioners' sugar. A friend of ours was hosting a pumpkin themed party. He seemed to have the savory food covered so I thought I'd use the party as an excuse to make pumpkin cookies. It is well documented that while I like pumpkin, I do not like pumpkin pie or the combination of pumpkin and pumpkin pie spice (despite liking all of the components of said spice) and avoid it at all costs. So these are pumpkin cookies! I think the expectation of the combination of pumpkin and pumpkin pie spice (I partially blame a certain coffee shop chain with a penchant for seasonal flavors) is so ingrained in people that when they eat something that is just pumpkin they are surprised when it doesn't taste like pumpkin pie. It is a shame because pumpkin by itself and paired with other flavors is so good! Luckily, I've been developing pumpkin pie spice-less recipes for years now as part of my quest to lure people away from pumpkin pie: pumpkin black bottoms, pumpkin chocolate chip oatmeal cookies, pumpkin spiked chili, pumpkin coconut bread, pumpkin power muffins, pumpkin cornbread, pumpkin pancakes with homemade cinnamon butter, perhaps my most popular pumpkin recipe: pumpkin cheesecake brownies and my personal favorite, pumpkin five spice sweet rolls. This are softer, chewier cookies, like most cookies made with pumpkin, so don't expect a crisp cookie. But they are moist, flavorful and pumpkin-y which more than makes up for a snap. 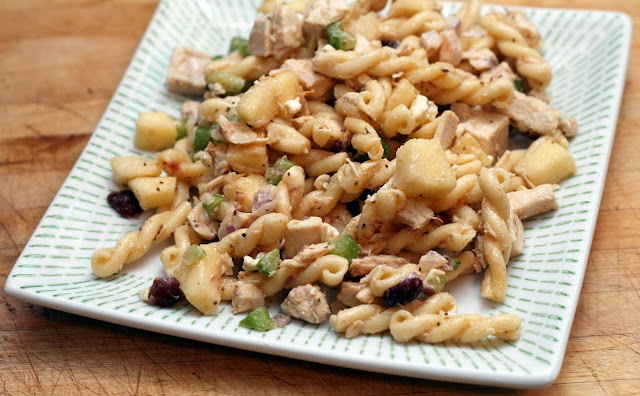 In a large bowl, toss together the chicken, pasta, apple, cranberries, onion, celery and zest. Set aside. In a small bowl, whisk together the dressing ingredients. Drizzle over the salad and stir to evenly distribute all ingredients. I like making meal-like pasta salads because they are not only an easy dinner, they make great leftovers for lunch. Even though I work from home, I normally don't have time to whip up something new for lunch so it wonderful when I have something tasty in the fridge waiting for me. I've made a summer chicken pasta salad and a winter chicken pasta salad so I thought it was time to make an autumn version (I guess this means I have to make a spring one too, right?). What is more autumnal than apples? I added some cranberries to keep it all from being too sweet, celery for crunch and a zippy dressing. Nothing fancy but it really comes together to make a satisfying dinner. Or lunch. Update: I made a spring version! Preheat oven to 350. Mix all of the ingredients together. Pour into a pie plated lined with a pie crust. Top with a second pie crust and pinch shut. Pierce the top crust with a knife or cut out shapes to vent. I used a large leaf shaped cookie cutter to cut out leaves and used them to create the top crust. Bake 30 minutes or until golden brown and bubbly. Cool then slice to serve. 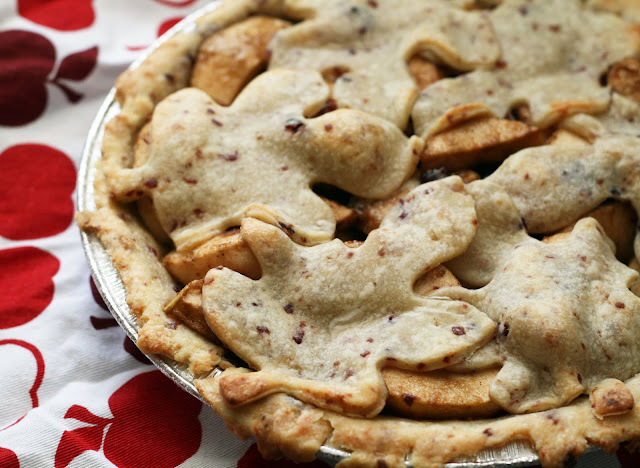 This is perhaps an award-winning pie! I've been helping the Baltimore Orchard Project, a group that harvests fruit in public parks and private homes that would normally go to waste and distributes it to those in need, by providing recipes featuring locally grown produce for their website and in the spring, teaching canning classes. They were invited to have a "celebrity" enter an apple pie on their behalf in a contest benefiting Carroll's Hundred, an organization that hopes to build an historical greenhouse or orangery on an underutilized area of Carroll Park. Loving food and possessing a degree in Urban History, I was too happy to provide a pie! I had to make it in a disposable pie tin, which I had never used before but it wasn't difficult. This recipe makes a little more filling than would fit in the disposable tin but I think it would work perfectly in a regular pie plate, the disposable one was shallower than every one of my normal pie plates. I ended up making a couple hand pies with the leftovers, which was awesome because otherwise, I wouldn't have been able to try the pie at all! Which would have been a shame because it is a truly scrumptious pie! I wanted to do something a little different so I thought I'd add some dried cranberries to the filling which ended up plumping up in the oven (a good call using dried, I think fresh might have oozed) and adding a pleasant tart note to the pie. I also left out cinnamon, perhaps a pie crime but one I think was inspired, as cinnamon tends to overpower everything else in the dish but in this pie, you can taste the apple, cranberry and the cheddar from the pie crust in every bite. Plus I love ginger and allspice more than I like cinnamon. It was lovely and I plan on making another one soon so I can have the whole pie to myself! 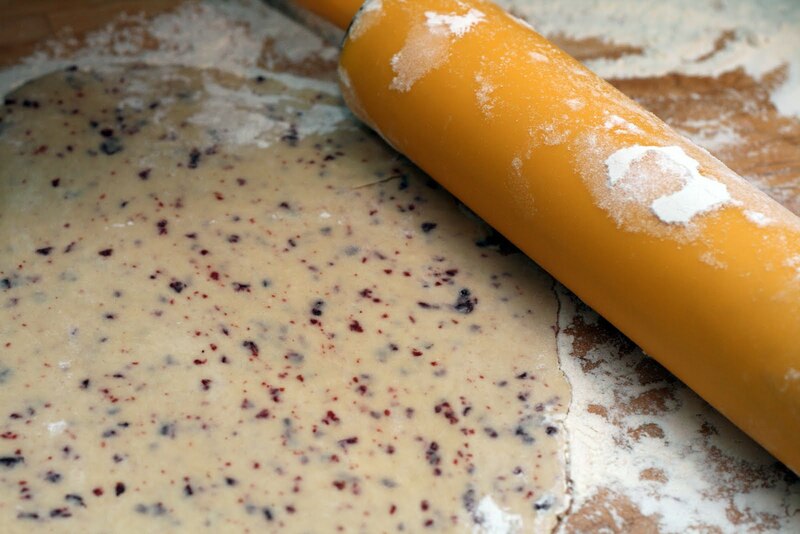 Place the butter, flour, cranberries and cheddar into a food processor. Add water one tablespoon at a time and pulse just until mixture sticks together. Divide the dough evenly into two balls. Roll each into a crust. This dough rolls out like a dream. I was a little worried because I had never tried putting fruit in a pie crust before but it worked wonderfully. The food processor pulverizes it enough that it doesn't make the dough lumpy but not so much that you don't get a burst of cranberry. A tasty twist on traditional pie crust. 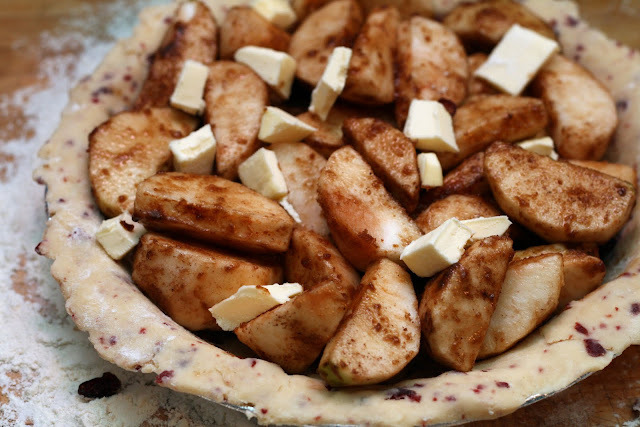 I like this pie crust on Apple-Cranberry Pie but it would be great pretty much any pie that needs a double crust. Mix the spices together. Set aside. Cut the end off of each onion so it can sit flat in the bottom of a 6-quart oval slow cooker. Take care that all of the onions are of roughly the same "height" and you are leaving enough room in the slow cooker for the chicken. Shove the lemons and garlic into the cavity of the chicken. 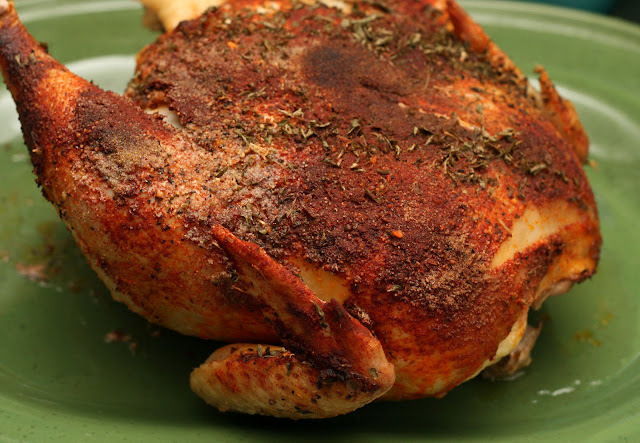 Rub the chicken with canola or olive oil. Rub the spices into the skin of the chicken on all sides. Place on the bed of onions. Allow to sit 5-10 minutes then carve. Note: You really need an oval slow cooker for this one. A 6-quart oval should hold up to a 7-8 lb chicken and anything smaller. I know there are places where you can get a fully cooked, rotisserie chicken for less than what you could buy a whole, uncooked bird. However, they are usually on the smaller side and we like to buy our chickens at the farm store where there is not much financial incentive to buying rotisserie. On the other hand, who wants to roast a chicken in the oven all the time? It is certainly easy but if you are like me, there are times when you either a. don't want to heat up the house or b. have something else in the oven. Enter the fauxtisserie chicken. Made with no liquid but on a bed of onions so it isn't just sitting in its own fat for hours, it is just as flavorful as a store-bought chicken and requires virtually no fuss. No fuss! No muss! The skin isn't crisp like it is on a oven-roasted chicken but neither is the skin on the rotisserie chicken you snagged at Costco either. The spices seep into the meat, flavoring it, and the skin keeps it from drying out. This is the perfect chicken to serve as-is or to use in the place of cooked chicken in any recipe that calls for it. I actually like to make this when I am making something else for dinner or baking a cake or something so I know I have cooked chicken ready to go for lunches or dinner the next day. Chop the turnip greens. Peel and cube the turnips. Add the turnips and potatoes to a large pot. Fill with water. Bring the turnips and potatoes to a rolling boil. Continue to boil until both are about halfway cooked, 10-15 minutes. Add the chopped greens and continue to cook until the the turnips and potatoes are fork-tender. Drain. Add remaining ingredients and mash until desired smoothness is obtained. *I used 0% because that is all the store had. Tips: Take care to remove the tough inner stem (rib) of the turnip green leaves. Dice the turnip a bit finer if it seems a bit denser than the potato so they are both ready at the same time. If you can't find turnip greens sub in chopped spinach. I rarely see turnips with their greens attached so I snatched them up and amended my intended mashed potatoes side to include turnips and their greens. Now, I've heard some people don't like turnips but that's a shame. 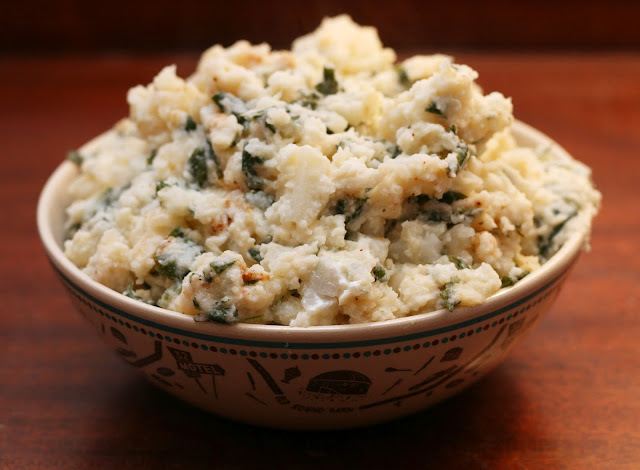 They are sort of peppery, mash well and are a super easy way to sneak a little vegetable into your mashed potatoes. Not that I need to fool anyone, we're all adults here, but I hate making more than one side dish a night. It just generates too many leftovers and most of the time, we just don't end up eating them all. This way I feel like I had a good healthy vegetable side and my mashed potatoes. You can leave out the Greek yogurt if you want, you can't really taste it but I think it adds some creaminess without adding, well, cream. If you have any left, live a little and fry it up as patties in a little butter for a sort of Southern take on bubble and squeak. Preheat oven to 350. Butter and flour or spray with cooking spray with flour one standard loaf pan or one 4-cup mini loaf pans. In a large bowl, beat together all of the wet ingredients. In a small bowl, whisk together dry ingredients. Mix until well combined. Pour into prepared pans and bake for 45-60 minutes. Cool on wire rack for 10 minutes then remove from pan. I had some bananas that were positively leopard print so I knew it was time to make banana bread. I've made a few different types of banana bread but never with coconut. 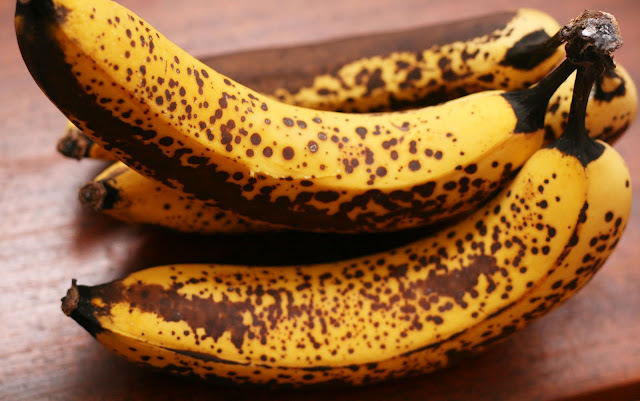 When I was looking at the bananas I was thinking about how they are so ubiquitous yet actually a tropical fruit. So why not do something vaguely tropical with them? 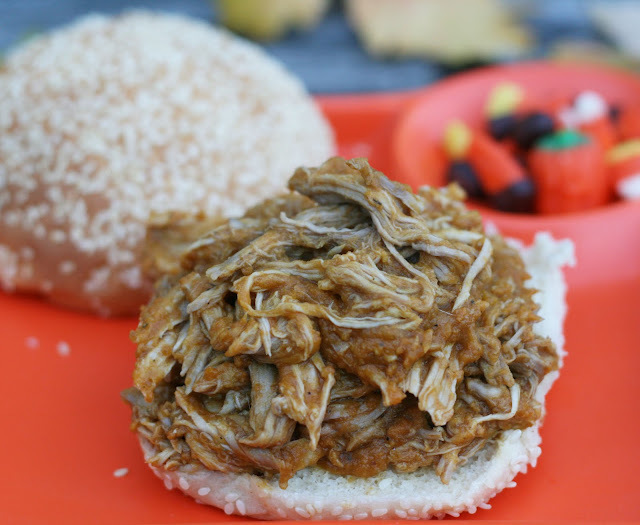 The finely shredded coconut added a lot of flavor without the chewy texture coconut can sometimes add to quick breads. 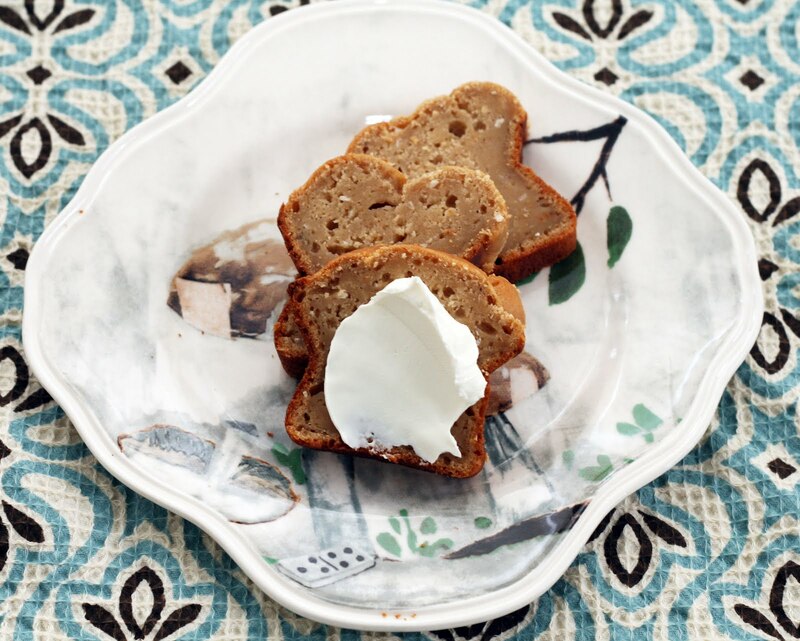 The yogurt kept the slightly dense bread moist, making it perfect to wrap and save for breakfasts and snacks for nearly a week. Which is exactly what my husband did with these mini loaves. Pour the cider in the Ball Jam & Jelly Maker. Whisk in the pectin. Press the jelly button. You will hear a beep at 4 minutes. 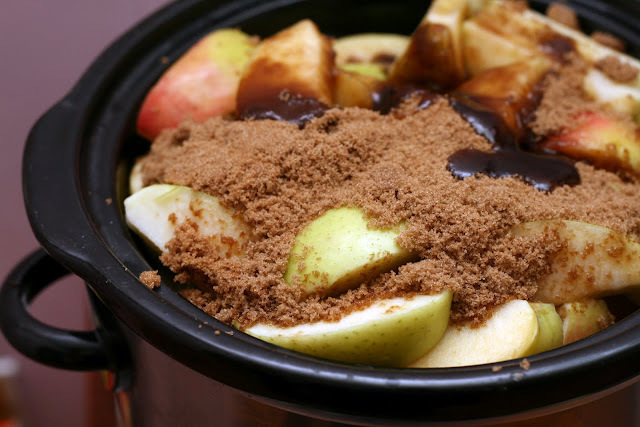 Sprinkle the sugar and spices over the fruit mixture while the machine is still running. Cover and wait for the jam cycle to complete. Press the cancel button and unplug the machine. Ladle the jelly into prepared jars leaving 1/4 inch headspace. Process in the hot water bath for 10 minutes. *I recommend these jars of flex batch pectin. 3 tablespoons equals 1/2 of a pouch of boxed pectin. When I first got the Ball Jam & Jelly Maker, I was honestly most excited about the jelly option. I've had some luck making jelly in the past (and you can make this recipe using that technique) but I find it more difficult to tell when the jelly is ready than jam. I am generally too impatient/not in possession of enough fruit to do the jelly bag thing so I've been making jelly with easier to obtain juices. Which still yields awesome jelly and doesn't make me want to collapse in a heap. Anyway I waited until apple season to try out the jelly feature so I could make what I've been thinking about for years: apple cider jelly. Yum. It really does taste like mulled apple cider. Except it is spreadable and awesome in sandwiches. Preheat oven to 400. In a large bowl, mix together the turkey, egg, matzo meal, shallot, spices and 2 tablespoons of the apple butter. Form into a loaf. 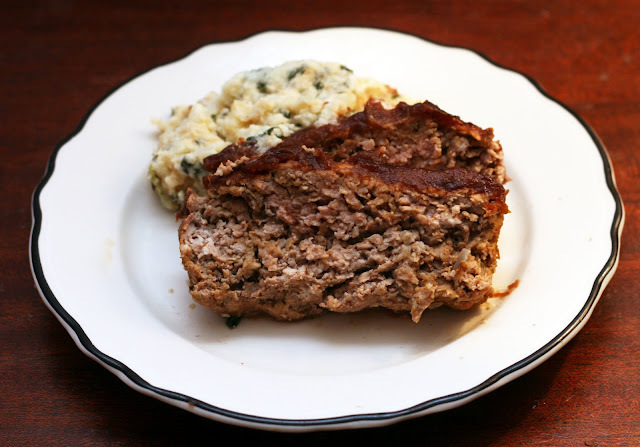 Place in a loaf pan (or, preferably, a meatloaf pan). Brush the top with the remaining apple butter. Bake for 30 minutes or until fully cooked. Wait a few minutes before slicing. 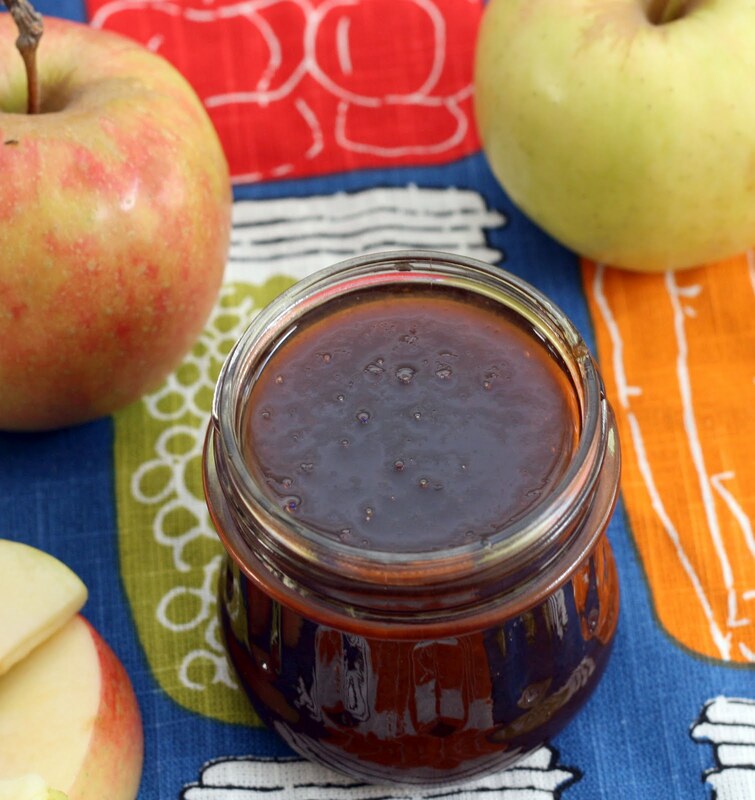 I always get a lot of questions about how to use apple butter once you've made your own or bought a jar. Honestly, most of the time we just have it on sandwiches but I did make a great cheesecake with it once and a really yummy, versatile barbecue sauce. This year I thought I'd try something even more savory and thought it would pair wonderfully with turkey. I knew it was going to be a winner when even the raw meat mixture smelled really, really good. It is a moist but not crumbly meatloaf thanks to the turkey thighs and apple butter glaze that helped seal in the the juices. I hate dried out meatloaf! The leftovers make awesome sandwiches. If you have any. Preheat the oven to 350. Line 2 cookie sheets with parchment paper or silpats. In a medium sized bowl combine flour, oats and baking powder. In a large bowl, cream the butter and sugar until light and fluffy. Add the egg, Nutella and vanilla paste. Combine thoroughly. Gradually add the dry ingredients to the sweetened butter and mix until a very thick dough forms. Fold in the chocolate chips. Take care that they are distributed evenly. Form cookies by dropping a heaping 1 tablespoon of dough on the sheet 2 -2 1/2 inches apart. Flatten slightly. Bake 12 minutes. The centers still may look slightly shiny. Carefully remove to a wire rack to cool completely before serving. I was going to make marshmallow cookies but then realized I was out of mini marshmallows. I had jumbo and regular but no minis! I'm falling down on the job. I was looking for something else to add in and came across a jar of Nutella with exactly 1/3 cup left in it. Perfect! I can make yummy cookies and help clean out my overstuffed cabinet at one time. Don't mention the fact I opened up a jumbo box of oatmeal and only used 1/2 cup out of it. Luckily these cookies are super delicious! 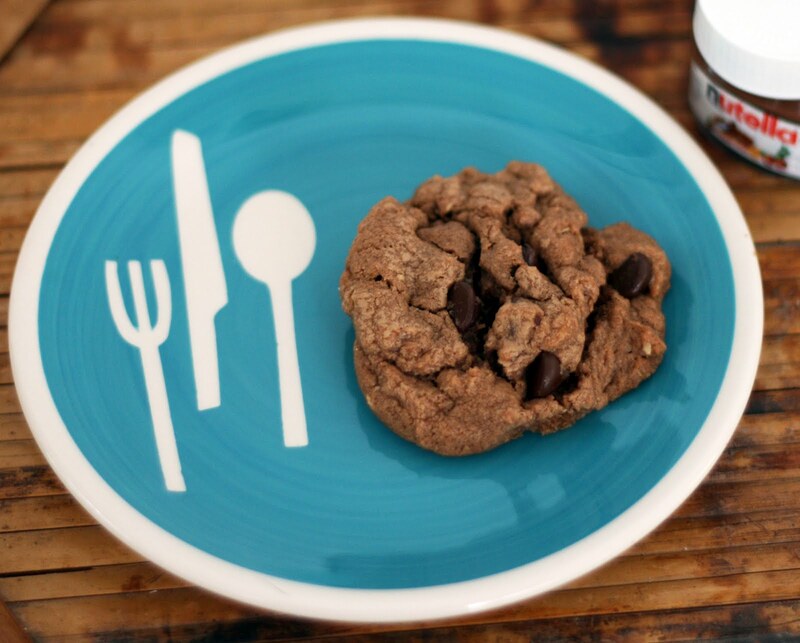 The dark chocolate chips add perfect bursts of chocolate-y goodness and the oatmeal added a bit of heartiness and chew to the cookie. The Nutella insured that the chocolate flavor was throughout the cookie and added a creamy note I really enjoyed. One more thing: I normally buy imported Italian Nutella but recently I picked up a jar of regular American Nutella and it seemed thinner than it used to be. More like the consistency of peanut butter than Nutella. Anyone else notice this? I swear the American stuff used to be thicker and more Italian-like in texture. At any rate, it was still perfectly tasty and worked wonderfully in this recipe. Place all ingredients in a 4 quart slow cooker. The apples should come to the very top of the insert. Cook on low for 10-12 hours. 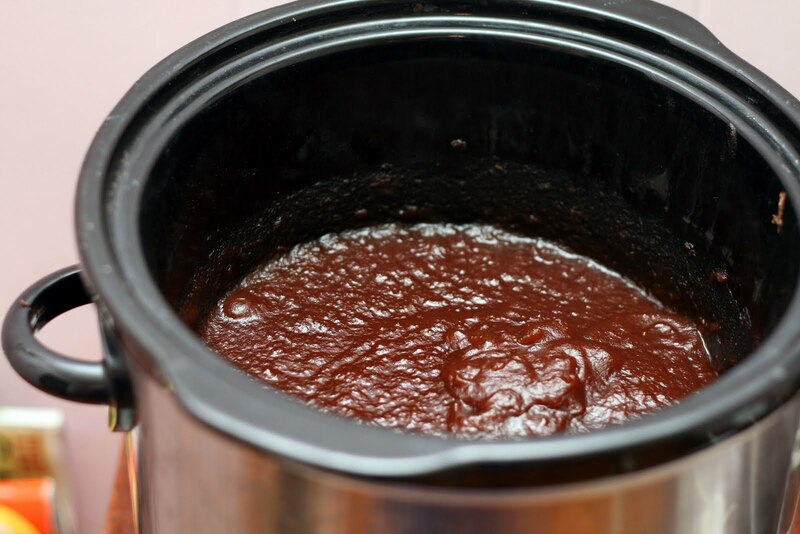 Vent by placing the lid on askew and cook on low for an additional 10-12 hours or until most of the liquid has evaporated and the mixture has reduced and thickened. Pour the mixture into the food processor or use an imersion blender to puree. Cool completely and refrigerate up to 3 weeks or ladle when warm into prepared jars leaving 1/4 inch headspace and process in a hot water canner for 10 minutes. *A apple corer/slicer makes quick work of this. I know when I have finally accepted it is fall when I break down and go to the farmers market and come back with apples and cider. That means it is apple butter time! I know you can make apple butter on the stove and last year we saw it being made over a wood fire in a town square but I can't see making it at home any way but in the slow cooker. It takes all of the work and watching out of the process and I think the final product is better than stove top variations. I will admit I liked the slightly smoke of the town square butter but I don't think my neighbors want me building a fire pit in the backyard for open air apple buttering. For this year's apple butter I splashed in some rum and vanilla paste to really deepen the flavor of the dark brown sugar so the end product ended up tasting like a grown-up caramel apple. I used Jonagolds because they are naturally sweet and cook down really, really well but any apple suitable for cooking would work just fine. 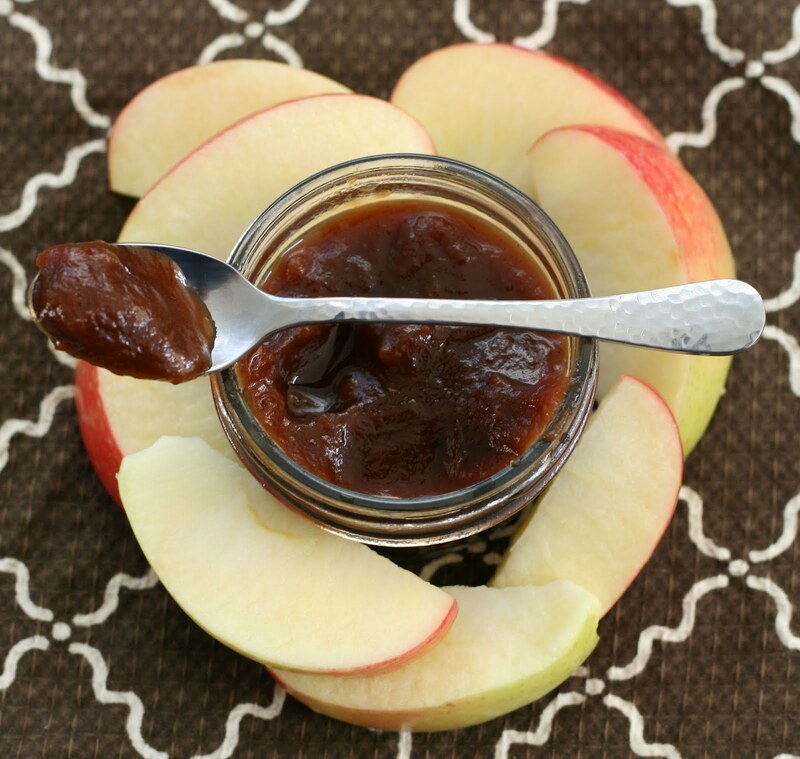 Added bonus: your whole house smells like apple butter for a day.